"Namu" is a part of a Buddhist prayer. In Soul Calibur, he tends to recite it quite the bit. Go see http://www.manjikai.com/yts/page.php?id=67 about all the things Yoshi has more or less accidentally slipped out of his mouth. Thanks koga. But does it mean anything by itself? Namu comes from the Chinese transliteration of the Sanskrit word namas, and means to take refuge in the Dharma wholeheartedly, with utter faith and trust. The state of religious exaltation in which we (=Buddhists) feel inexpressible gratitude to and joy in the Dharma is also included in the word namu. Yoshimitsu of course that is why i'm here he is soooo my favorite caracter i love his honour and swordsmanship. Oh and looks he is sooooo cute (Hugging a picture and figure of Yoshimitsu:love. Yoshi is my favorite character since I first started playing Tekken 2. But I'm rather surprised, that noone here seems to like Lei WuLong. For me, the fascinating thing about Yoshi is his unique and flashy playstyle, which offers insane versitality and allows every player to find their own style, whereas many other characters are pretty much build around a hand full of effective attacks and combos, that don't leave as much freedom to the player as Yoshis attacks do. And the exact same thing goes for Lei. His different forms of ancient Kung Fu, his ground techniques, his punch and kick sequences, they all offer a sheer unbelievable variety of playstyles, and I love that. Other characters I enjoy playing with are Law and Feng. my fav? probably devil. love blasting everyone to pieces! also i love his tekken 2 arcade theme. it's so cool! Absolute fave? Yoshimitsu, this website is awesome. I thought I was the only one in the world that just thinks this guy is the coolest guy ever. I just decided to pick him one day out of the blue when i first started playing Tekken 3, and I found that his moves were funny and sort of made a joke out of the opponents serious fighting style. Then I read his story and he's really got a mix of rebel,scifi,humor,looney,and trickery some of my favorite things, so I kept using him from then on. His skull knee pads are funny, as well as him wearing like colonial pilgrim shoes with a samurai outfit. If I ever find the opportunity I love making him sit down and glide. One time I turned him around and my friend threw a high punch and it missed (cuz he ducks for a second when he turns around), and I won the match by doing a harikiri on myself and stabbing my friend as it went through. 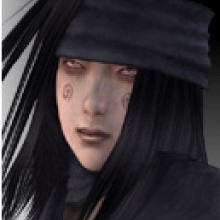 Favorite outfit is the big hat on tekken 5. looks kinda like a nomad. I think from the books i've read that that outfit is probably more what a ninja looked like, just normal everyday clothing.